Super Hero Boy: All natural goodness! If your anything like me you are always worried about the chemicals going into your child's body and finding new organic products to make your life a little more chemical free is always fun. I'm in love with lavender bath products for Connor and myself. I've used lavender products so often with him that when he is having a super cranky night all I have to do is spray some lavender room spray in his room and it usually settles him down. I've even reverted to wearing a lavender based perfume as I know it calms my own nerves as well and with my current schedule at school I'm always keyed up. I honestly think I get as much pleasure giving him a bath in lavender baby wash as he does as its just sort of become our routine. With that said its just sometimes hard to find a good organic lavender body wash that's great smelling and affordable for everyday use. Sum-bo-shine offers a lavender and aloe baby wash and lotion that smells amazing, is great on Connor's eczema and at about $11-12 a bottle its very affordable in the organic market. All of Sum-Bo-Shine's products are 100% organic, natural, nothing artificial, and completely vegan other than the diaper rash cream which has beeswax. Speaking of the Diaper Rash Cream I'm in love with that cream for daily use. Connor is a rash magnet and I put cream on him regardless of if he has a rash or not as the moment I let it go he ends up with a horrible rash. The Sum-bo-shine Diaper Rash cream is unlike any other cream we have used, its actually very thin and not pasty at all, and it has just a tiny bit of tea tree oil which gives it a great almost cooling affect (not to mention that tea tree oil is fabulous for dealing with itchy skin). Though Its a bit too runny for me to consider it a great overnight cream its wonderful as a preventative cream and works great as a daily cream. It does not include any zinc oxide which I love in a daily cream but I'd be the first to admit we still use a zinc oxide cream when Connor's rashes get bad enough, as much as I'd love to avoid doing so its a fact of life for us. If your a a baby oil fan, you will love Sum-bo-shine's baby oil. Mixed with a bit of chamomile and rosemary it smells amazing. I was half tempted to rub it all over my own body! heh. Baby oil is a great moisturizer and we used alot of it when Connor was younger as a cradle cap preventive. I can happily say we made it totally through the infant stage with no cradle cap thanks to just a little bit of baby oil every day. Sum-bo-shine's products are available directly from their website. I highly recommend the baby wash and diaper rash cream but all of them are equally awesome! I have a little gift bag of Sum-bo-shine products to share with one of my readers! Leave a comment on this post. Check out Sum-bo-shine and tell me what product you'd like to try the most and what appeals to you about their products! I love that the products are not only all-natural, but actually vegan. I would love to try the bath powder. I like the fact that everything is so pure and made with "simple natural ingredients". I like the looks of Sum-Bo-Shine Aloe & Lavender Shampoo and Body Wash. The reason is the smell and that I do not have to have 2 products for body wash and shampoo. Wow, the bath salts sound amazing. I could use a good soak! I love that they are basic, not gimmicky. I would like to try the Sum-Bo-Shine Aloe & Lavender Organic Baby Lotion. I love that they are cruelty free. The Aloe and Lavendar lotion sounds nourishing and soothing. No petroleum products! Organic and has soothing almond oil,chamomile and all my favorites in one! I want to try the Sum-Bo-Shine Aloe and Lavender Natural Baby Shampoo and Body Wash. I love that everything is all natural and you can figure out what is in the product by the ingredients, not like weird super long chemical words that no one knows that are in many other bath and body products. Thanks for the chance to win! I would love to try the aloe and lavender shampoo and body wash! The feature I find most appealing is Truth in Labeling. We as consumers deserve that. Cruelty Free is a must. Sounds like Sum-Bo Shine makes no comprimises...You go Sum-Bo! I really love that the products are truly 100% natural. I'd like to try the Natural Himalayan Bath Salts Plus -Not Your Ordinary Bath Salts. I think that the baby lotion would be nice to try. I've had a hard time finding a natural lotion that smelled good and was affective, so I would love to give this one a shot. I'd like to try Sum-Bo-Shine Aloe and Lavender Therapeutic Bath Powder. The Naturally Pure Baby Oil is what I would like to try the most! I'd love to try the Naturals & Organics Package so that I could sample all of their products, but the baby oil is top of the list. I love that the products do not contain mineral oil or parabens. Sum-Bo-Shine Aloe & Lavender Organic Baby Lotion, cause I want to try it too! I love that it's organic. Way cool. I would enjoy bath salts. I would like to try the Natural Himalayan Bath Salts Plus -Not Your Ordinary Bath Salts. I like that they contain no artificial dyes or fragrances. I love anything that is 100% all natural and so does my sister - who is expecting her first baby in January. These look great! I'd love to try Sum-Bo-Shine Aloe & Lavender Shampoo and Body Wash :) Thanks so much! I'd really like to try the Baby Oil. And I love the fact that there are No Artificial Fragrances or Dyes. My son and I both have very sensitive skin. This would be great! Vegan! Yay! Chemical Free! Bigger yay! I'd love to try the Sum-Bo-Shine Aloe & Lavender Shampoo and Body Wash, I can only imagine how good it smells! I would like to try the therapeutic bath powder. I love that they are cruelty free! I would love to try The Aloe and Lavendar lotion or the baby products. I like the fact that they are natural and the fact that they not tested on animals is awesome! 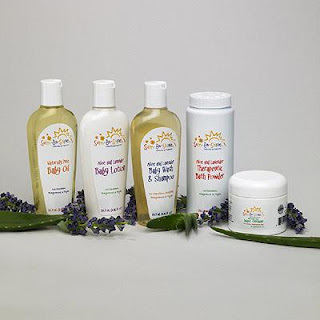 I would love to try the Sum-Bo-Shine Aloe & Lavender Organic Baby Lotion on my little one. Most of the time I just dont lotion him at all b/c I fear all of the chems leaching into his little system. With these looks like I wouldnt have to worry abt that-thanks. I like that their products have no chemicals. My little ones have sensitive and frail skin that can't handle tough cleansers and chemicals. Thanks! I would definitely get the aloe and lavender lotion, too! I would love to try the Lavender and Aloe Baby Shampoo and Body Wash. We are always on the lookout for all natural products that will be gentle on my daughter's sensitive skin. Thanks! I love that they are cruelty-free and vegan. I'd like to try their Natural Himalayan Bath Salts. I too really like the fact that they are 100% natural, I worry about the chemicals that are put into products these days. I would like to try the Naturally Pure Baby oil. I would like to try the lavendar baby wash. These products are great because they're all natural, none of that crazy stuff that's found in most products these days. I'd try the Sum-Bo-Shine Aloe & Lavender Organic Baby Lotion. Sum-Bo-Shine Naturally Pure Diaper Ointment looks great! I love that their products are not filled with chemicals. Thanks! I would like to try the Sum-Bo-Shine Naturally Pure Diaper Ointment. It appeals to be because it organic. I'd love to soak in their bath salts. I love that these products are all natural. I'd really love to try the Sum-Bo-Shine Naturally Pure Diaper Ointment and the body wash. These products sound wonderful. I would love the aloe and lavender lotion. That would be great for bedtime baby massages. It's trivial, I admit, but I like that they offer free gift wrapping. It makes it a lot easier when you're shopping for baby showers. I would love to try the Sum-Bo-Shine Aloe and Lavender Therapeutic Bath Powder. It sounds wonderful (and I bet it smells great too!). I love how they are all natural, cruelty free products. That is PERFECT! I'd like to try the bath powder. I like that it is so pure and natural. The lavender lotion sounds very soothing. I like the fact they have nothing artificial in them. I'm a vegetarian, so I think it is great that these products are vegan-friendly (and hence animal friendly). I would like to try the Sum-Bo-Shine Aloe and Lavender Natural Baby Shampoo and Body Wash. I like this product: Sum-Bo-Shine Aloe & Lavender Organic Baby Lotion. It says it doesn't contain sulfates or parabens and will protect baby's delicate skin. I would like to try Sum-Bo-Shine Naturally Pure Diaper Ointment. I like that Sum-Bo-Shine products are Cruelty Free, No Artificial Fragrances or Dyes and No Phthalates or any harmful ingredients. All natural appeals to me. I love the fact that all there products are vegan and naturally pure, I'm always looking for products like this so thanks for making me aware of the sumboshine website! I like the Aloe and Lavender Organic Baby Lotion, and I bet it smells so good! Of course the fact they are all natural with no chemicals appeals to me ... I'd like to try their shampoo and baby wash. Thanks! My favorite will be Sum-Bo-Shine Aloe & Lavender Shampoo and Body Wash. Sounds lovely. I would love to try Natural Himalayan Bath Salts Plus, these are for adults, does that make me selfish?! I most love that everything is chemical free. an item that I would like to try is the Sum-Bo-Shine Naturally Pure Baby Oil. I would like to try the Sum-Bo-Shine Aloe & Lavender Organic Baby Lotion. Sum-Bo-Shine Aloe & Lavender Organic Baby Lotion would be great to try. Most baby lotions just have way too much of that baby powder scent. I like that the Sum-Bo-Shine products are cruelty free. I'd like to try the Aloe and Lavender Therapeutic Bath Powder. The body lotion because I have yet to find one that I really, really like. These look great because they're natural! I like that their products are dye-free and safe for my baby's sensitive skin. I'd love to try the diaper ointment. My daughter has a lot of bad diaper rash and we're always looking for a good treatment. I'd love to try the Sum-bo-shine Aloe & Lavender Baby Lotion. It sounds wonderful!!! The thing that appeals to me the most about this product line is the LACK of chemicals being used. The more I educate myself on what these chemicals are doing to our bodies the more driven I am to find natural products!! Would really lke to try the Aloe and Lavender Baby Lotion! Oh I definately would love to try the Sum-Bo-Shine Naturally Pure Diaper Ointment. I'm expecting my first grand child and I can remember we always used desitine and I hated the smell.It would be so wonderful to be able to try something natural and smelled good! Sum-Bo-Shine Aloe & Lavender Shampoo and Body Wash - I like a multipurpose product. I like that they don't use mineral oil. I love that the products are all cruelty-free. The Himalayan bath salts look so relaxing! I would like to try the Sum-Bo-Shine Naturally Pure Diaper Ointment. My daughter still gets bad diaper rash sometimes. Great giveaway, thanks! no mineral oil cruelty free! This stuff rocks because it's 100% natural AND cruelty free. Two main things I look for when purchasing products for myself and my family. We go through a lot of lotion in my house so I would choose the Sum-Bo-Shine Aloe & Lavender Organic Baby Lotion. It would be nice to use an all natural lotion for my two daughters. Thank you for having this! I would love to try the Sum-Bo-Shine Aloe & Lavender Shampoo and Body Wash for my 3 little ones. Thank you! the Aloe & Lavender Organic Baby Lotion looks awesome! Like you said we like to use a lot of lavender in our house, so that is one reason I picked it. Another reason is because it is natural and organic. Really who wants to run hand fulls of chemicals and goodness knows what all over their babies? I'd like to try the himalayan bath salts but I love all their stuff! I only buy organic! Sum-Bo-Shine Aloe & Lavender Organic Baby Lotion would be great. Anti-cruelty products are important to me. I'm part of a dog rescue group and I see too much abuse. I won't buy products that contribute to it. I am subscribing to your blog's feed. My favorite is Sum-Bo-Shine Aloe & Lavender Organic Baby Lotion, and I have to agree with most and say I LOVE the fact that its all natural!Thanks for the great giveaway! Sum-Bo-Shine Aloe & Lavender Shampoo and Body Wash. I like that they are certified vegan and that they would be great for my granddaughter who has skin problems. I would love to try Sum-Bo-Shine Naturally Pure Baby Oil. I love that I know all the ingredients in this product, it's very reassuring. I am also a subscriber to your feed through my google homepage. and I'd love to try the Sum-Bo-Shine Naturally Pure Diaper Ointment. I love, love, love that the ingredients are organic and pure. I'd love to try the Aloe & Lavender Organic Baby Lotion. Thanks! Aloe and lavendar shampoo sounds great to me. I would like to try the Pure Baby Oil. I would love to try the aloe and lavender lotion. I would love to try the aloe and lavender shampoo and body wash. I love, love, love that these products are made from all natural materials. Cruelty Free is a must for me and I have purchased the baby lotion for my daughter in law and she adores it!!!! uses it on herself as well as the baby!! the aloe and lavender lotion sound nice.i like the products are naturel. Well, I'm pregnant and the only thing I want to do at the end of a long day chasing my 2-year-old is climb into a nice bath.... so the product I'd love to try is the "Not Your Ordinary Bath Salts." I mean, it's got aloe vera, chamomile, AND lavender... what's not to like about that!? Of course, what appeals to me most is the organic, natural list of ingredients. It's one of those things I only paid half-attention to before kids, but now I worry about what goes into and onto all of us so much more. These would be great for my daughter. I would love to try their products. Please enter me. I love that they are 100% natural, cruelty free and Truth in Labeling. I would love to try the Natural Himalayan Bath Salts Plus. Thanks for the chance to win your great giveaway! I'd love to try the Diaper Ointment. I think it's great that the products are organic and not animal tested! I appreciate the natural organic and vegan basis of the products. That's very important to me. I'd love to try the Sum-Bo-Shine Aloe & Lavender Organic Baby Lotion! These are great products, I love that they're all natural and cruelty free. I'd like to try the Sum-Bo-Shine Aloe & Lavender Organic Baby Lotion on my daughter's sensitive skin. The Milk & Honey Body Lotion sounds wonderful! I like that their products are organic. And that this lotion is paraben free and has no added fragrance. Thanks for the giveaway! I like the Sum-Bo-Shine Aloe & Lavender Shampoo and Body. What appeals to me most about the Sum-bo-shine's products is that they are chemical free and safe for my family to use. I have a 4 month old daughter and I want to keep her safe, healthy and at the same time keep her skin smooth and soft and free of any skin irritations. It is also important to me that the products I purchase for my family are cruelty free and vegan. These product cover all of my concerns. The products that I would like to try the most are the Naturally Pure Diaper Ointment for my baby daughter, the Sum-Bo-Shine Aloe and Lavender Therapeutic Bath Powder, and for me the Milk & Honey Body Lotion. want to try the Sum-Bo-Shine Aloe and Lavender Natural Baby Shampoo and Body Wash. The Aloe and Lavendar lotion sounds so good, healing and soothing at the same time. I love that the products are natural and not gimmicky. I love that there is nothing artificial in it! 100% organic and natural is a huge plus when it comes to baby skin products!! I like the "simple natural ingredients". i would like to try the shampoo. Milk and Honey Body Lotion - love that they are all natural! The Mrs. would love bath salts and loves things that are all natural.